And by what name is mashed potato known by that fount of the fanciful and practical, Mrs Beeton? Gotta love her. She can turn the simplest and most unexciting of dishes into a must-tryable delight with a sprinkling of French. INGREDIENTS – To every lb. 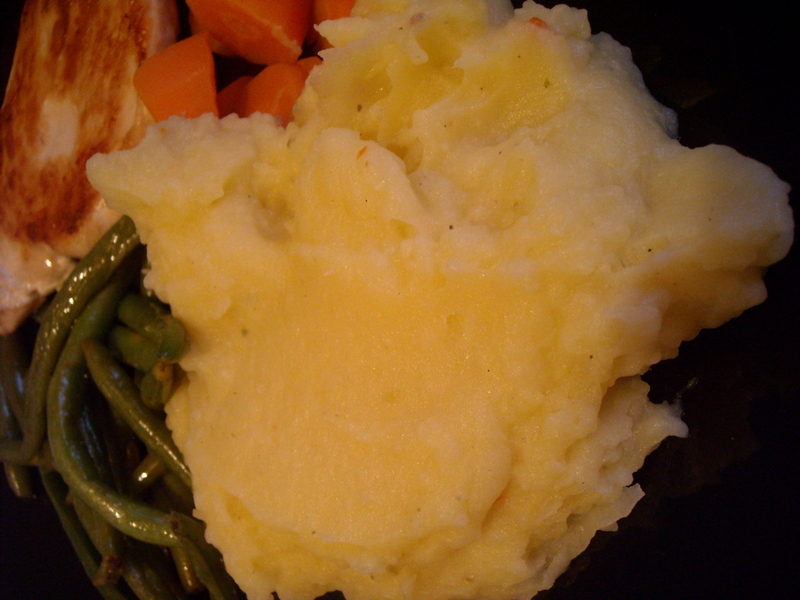 of mashed potatoes allow 1/4 pint of good broth or stock, 2 oz. of butter. I don’t know what it is with Mrs Beeton and butter. Everything seems to require a liberal splodge of deliciously creamy lemon-tinted fat before it can be pronounced worthy of the dinner table. In the interests of not denting our bathroom scales, I’ve found myself rebelling more and more often by slightly reducing the quantity in many (though not all) Household Management dishes. The trick with this dish is getting the quantity of liquid just right. Mrs Beeton seems to indicate that there’s a difference between regular mashed potatoes and this potato puree – namely, that the latter ought to be ”very thin[ly] mashed”. 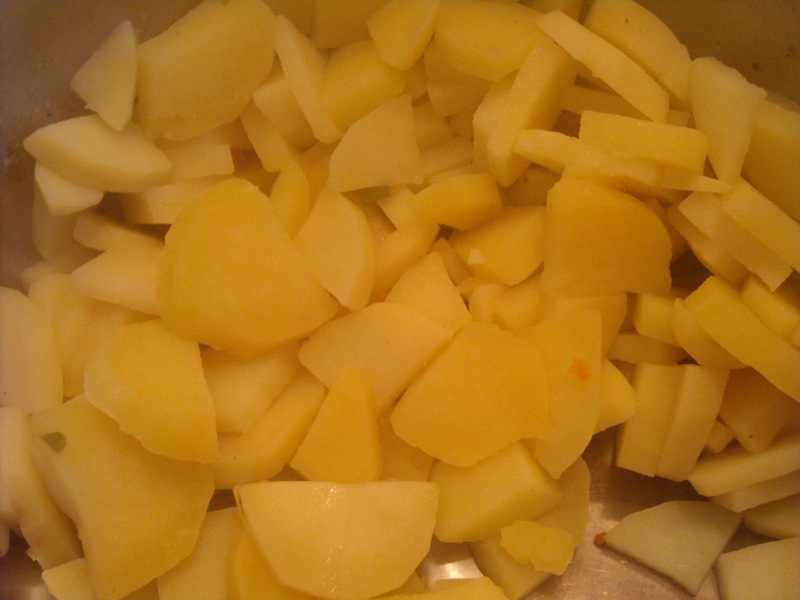 After boiling the potatoes, the broth is supposed to be added immediately before attacking the white mountain with a masher. As I began to mash, I couldn’t see any difference in consistency between this and the regular mashed potatoes, so I found myself adding a little more liquid (nearly double to stated quantity, in fact) before I was satisfied it was at least somewhat thinner than regular mashed potatoes. Even on the plate, there is little visual difference. The variation lies more in the mouth, with this version’s smoother, more buttery (eek!) taste. This entry was posted on May 10, 2010 at 5:21 am and is filed under food. You can follow any responses to this entry through the RSS 2.0 feed. You can leave a response, or trackback from your own site.